Kabob- e- Jujeh literally means grilled chicken and it consists of grilled pieces of chicken . This is one of the most popular kabob ( Persian accent for kabab) in Iran , often served with rice or Naan – e Lavash, a special kind of flat bread . Jujeh is typically ,like most other Persian kabobs , not spicy at all . Very few ingredients are used but the use of reasonable amount of saffron is noticeable , that being responsible for that marvelous golden look of jujeh ! As I said earlier , only few ingredients are needed for this beautiful kabob , onion , lemon juice , white or black pepper and saffron being the main ingredients . But to make it more tender , juicy and flavorful I added few secret ingredients too . Those are mayonnaise , orange zest and orange juice . 🙂 Usually breast meat are preferred for this kabob but you can use both breast and thigh meat, but should be boneless . I used breast meat and they turned out too good !! Saffron food color , optional , but that really helps to achieve that golden color. 1. Marinate the chicken pieces with all the ingredients and cover the bowl with plastic . Keep it in the refrigerator for at least 10 hours . The longer , the better . preferably 24 hours marination . 2. Give coal smoke just before you are ready to prepare it . For that lit the charcoal very well , then place it on a metal or small aluminium foil cup . Place it over the marinated meat and add some oil or ghee over the charcoal . Cover the bowl of the meat to lock the smoke inside . Leave it like that for 10 minutes . 3. Thread the chicken pieces onto metal skewers and grill until the chicken pieces are well-cooked . I did it in oven . For that bake in a pre-heated oven for 15 minutes at 400 FH and then broil for another 12-12 minutes . Serve hot with saffron rice or Shirin polo or Naaan -e Lavash . Gola or Lola kabab, a kind of rolled meat ball , are originated in Kandahar, Afganistan by the Poshtuns ; but it’s incredible softness and melt-in- mouth kind made it so popular , even beyond the boundary of it’s origin . The shape of the kabab resembles to that of the cannons or “gola”s , that is why it is named gola kabab. Gola kababs can be pan fried in a very little oil or can be grilled on charcoal or even baked and broiled in a oven . When grilled on charcoal , the golas of minced meat are put around the skewer , tied around with a thread , because unlike boti or sheekh kabab , only minced meat are used and if they are not tied with thread , the kabab may fall apart . For gola kabab , not only minced meat is used , the meat should be double minced , i.e, the mince meat will be beaten / blended again with spices before they are put on charcoal or pan fried . 🙂 Many uses binding agent like egg or besan( gram flour) in the recipe, but trust me , you won’t get the authentic taste if you use those binding ingredients . The kababs tend to fall apart and that’s the beauty . There are some very important notes to be remembered for the perfect gola kabab . I will discuss them at the end of the recipe. Grind them together into a fine powder . We need all , the whole quantity for this recipe . I skipped one spice, which is known as “filfil daraj” or long pepper , since I couldn’t find them in my nearby grocery . If you get them, take only 1 in this masala. 1. Put the minced beef in a food processor or blender with all the ingredients mentioned in “ingredients to be mixed with the mince”. Don’t add any water . beat / blend well . 2. Add 1 tbl spoon of yogurt and special masala in it . Don’t take the water of the yogurt . try to drain out the water from it before adding with the mince . 3. Smoke the mince with charcoal for five minutes . For that lit the charcoal very well , place it in a small bowl and put that small bowl on the mince . Then add ghee to the charcoal to create the smoke . cover the bowl with a lid and smoke the mince for 5 minutes. 4. Shape the kababs And keep it in the refrigerator for at least 24 hours . Don’t put them in the deep chamber. Keeping them in refrigerator for a longer time will help the kababs to get firmer and also the spices will get into very well . 5. For Pan frying , take a little oil to fry . At first , fry them on medium low heat for 10 minutes then increase the heat and fry another five minutes . Don’t over fry or else the meat will get tight . Be vary careful while flipping over . Try to flip one by one carefully , otherwise they may fall apart . You may bake the kababs in oven for 15 minutes at 375 FH and then broil another 5 minutes or until done . 1. Don’t wash the mince . So before making the keema or mince , wash your meat well . There should be no water in the mince . 2. I used grated ginger, garlic and papaya to avoid extra water . 3. The kababs tend to fall apart , so fry them gently . Don’t try to turn them over again and again . After taking them out from the oven , take out the skewer carefully , or else u may end up with broken kababs. 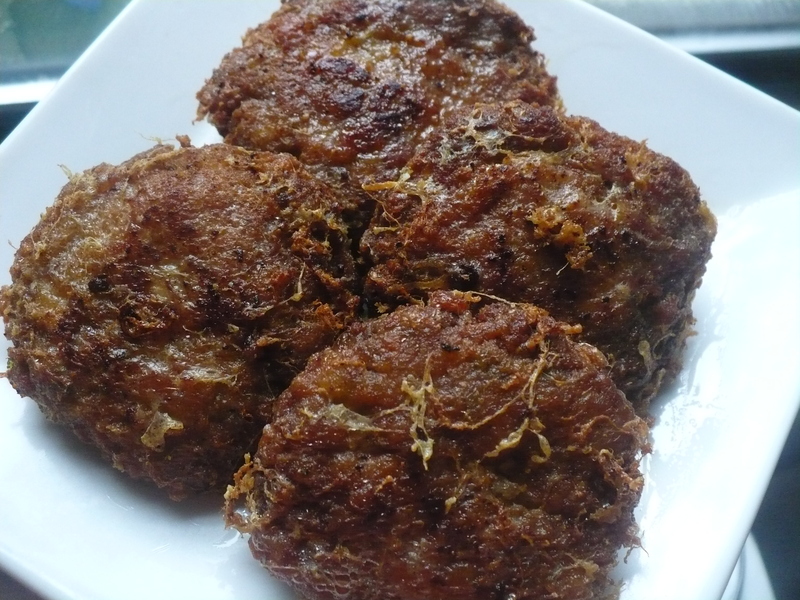 If you are afraid of broken kababs , you may tie a thread around the kabab before frying and grilling . It happens sometimes , you need to make some kababs in big batch immediately ,but opening the fridge,just discovered , you almost ran out of ground meat !!!! Don’t panic , try this recipe !!!!!!! It can be an ideal snack for your kid’s school lunch too . You can prepare these ahead of time. Fridge it and just fry them when needed. Half packet of Maggi noodles , boiled and drained out. 1. Boil the ground beef with ginger-garlic paste and soy sauce . Dry out the water and blend it without adding any water . 2. Combine beef, mashed potato and noodles together . Add Kabab masala , fried onion, chopped mint , chopped cilantro , green chili and salt with it . Now add the cornstarch. Mix very well. Shape them in Croquette’s shape. Dip in the beaten egg and coat with breadcrumbs. 3. Deep fry them on medium low flame until golden brown . Serve hot with your favorite dips!!!!!!!! 1. As I said earlier , you can make them ahead of time . In that case after shaping and coating , place them in a box and keep the box in your deep-fridge chamber . Just take them out and fry , whenever needed. The word ‘jali” refers to net. The outer texture of this Old Dhaka special kabab has that net effect by using a special technique. Simple but needs perfection!!!! 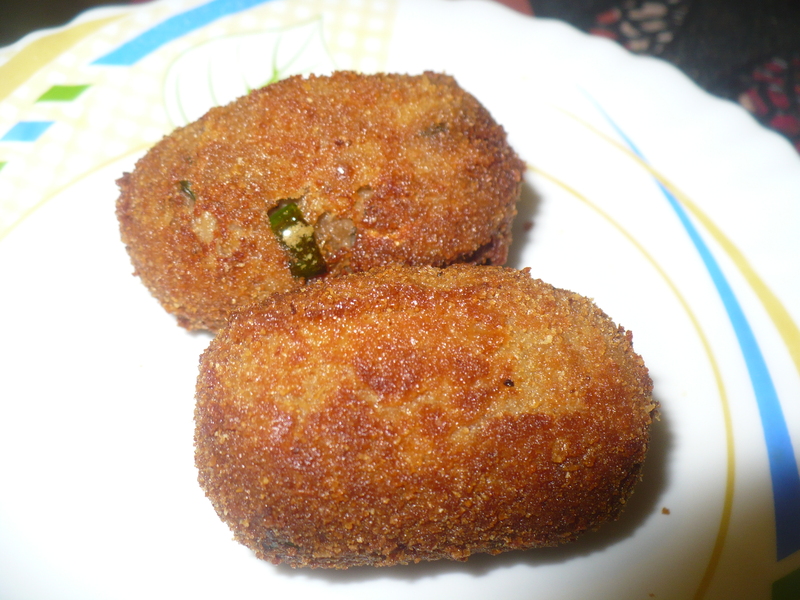 The first time I made jali kabab , looked like a “kabab stuffed fried egg” !!!! 😦 I learnt from this error that the egg mixture should be thin to make those jali !!!! !Failure is the pillar of success, indeed!!!!!!!!!!! 1. Mix all the ingredients together other than the ingredients mentioned for coating and frying. 2. Shape them and keep them in the refrigerator for half an hour. That would make the kabab firm. 3. 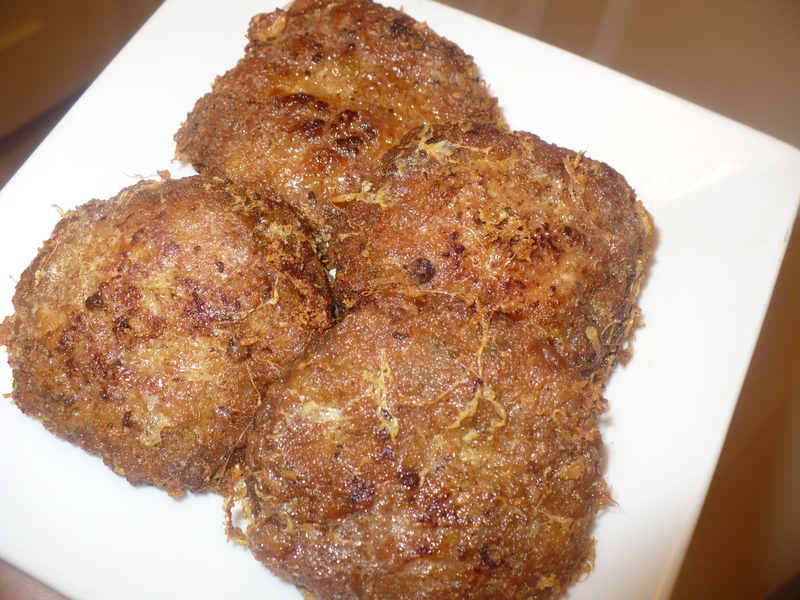 Dip the kabab into egg , then coat them lightly with bread crumbs and then again dip them into the egg and deep fry . Take some egg mixture in your hand and lightly sprinkle them in circular motion into the oil to create that net affect . Serve hot with Biriyani or Pulao!!!!!!!!! !